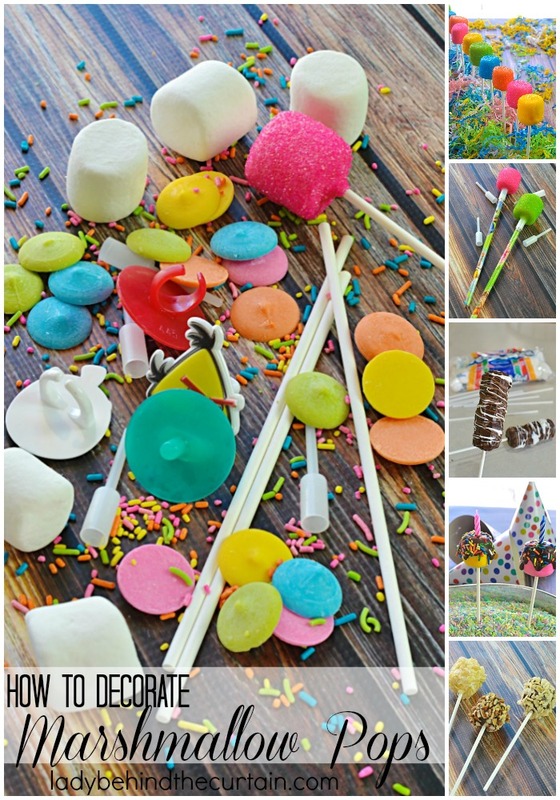 How to Decorate Marshmallow Pops | I’ll show you how easy it is to make these 10 minute treats. PLUS, for a little extra help scroll down to watch my video! Perfect for a kid’s party table, birthday party, Easter basket or dessert table. 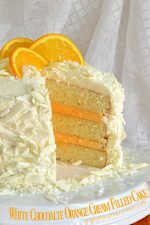 They add that little extra something special to any event or celebration. Dipped in vanilla melted candy and sugar sprinkles they remind me of peeps. 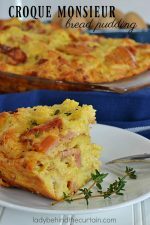 Fluffy on the inside and crunchy on the outside. PLUS! Because of the hard candy coating they stay fresh for days. 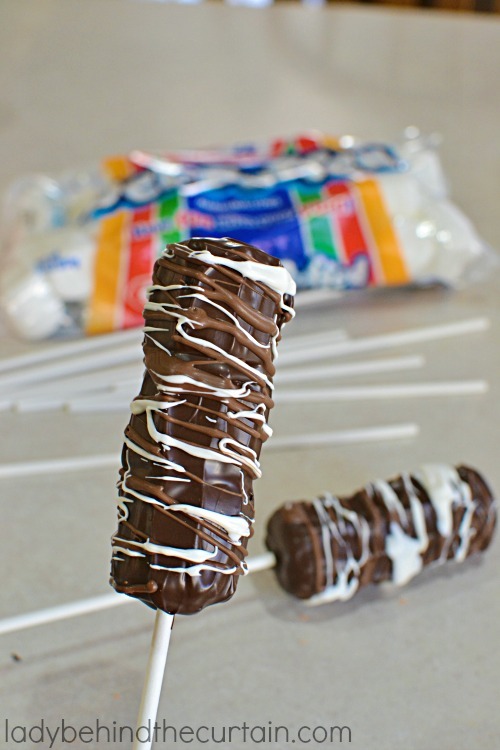 Your marshmallow pop doesn’t have to be just a marshmallow on a stick. 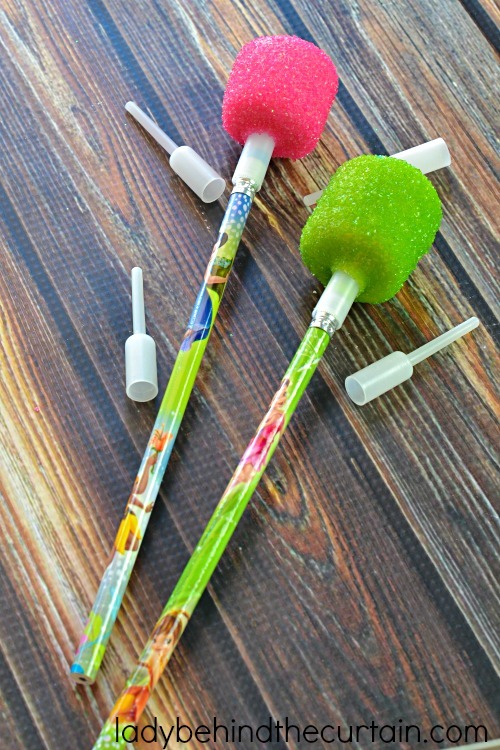 You can use a pencil topper, used and cleaned ring pops, turn them upside down and add a party themed ring. 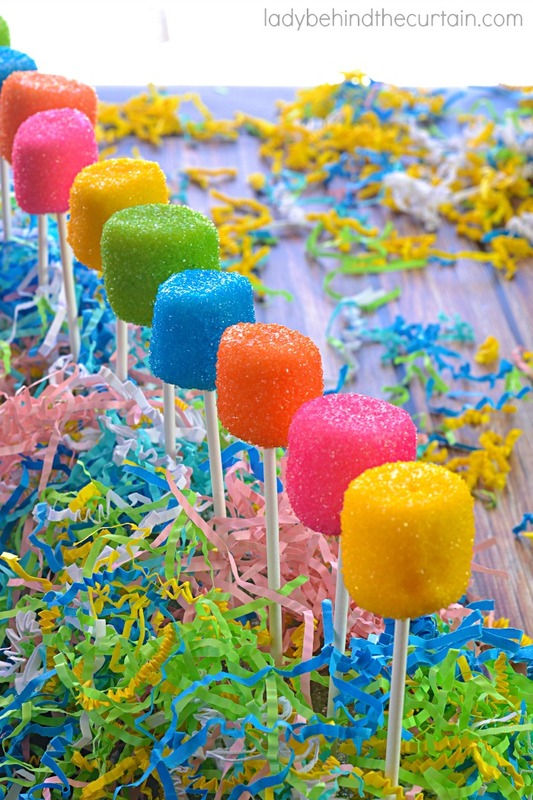 With an assortment of colors marshmallow pops will add fun to any celebration! READ BELOW FOR SEVEN WAYS TO USE THE BASIC METHOD AND MAKE IT YOUR OWN! 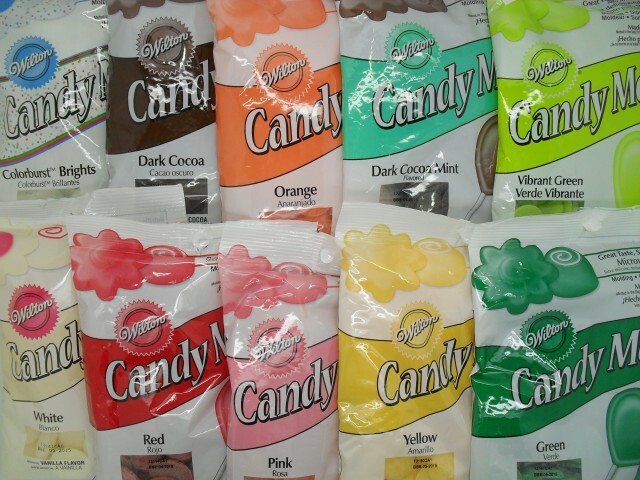 candy melts (color your choice) from Wilton (can be found at Walmart, Michaels and other craft stores). IMPORTANT: Before starting get all your supplies ready. 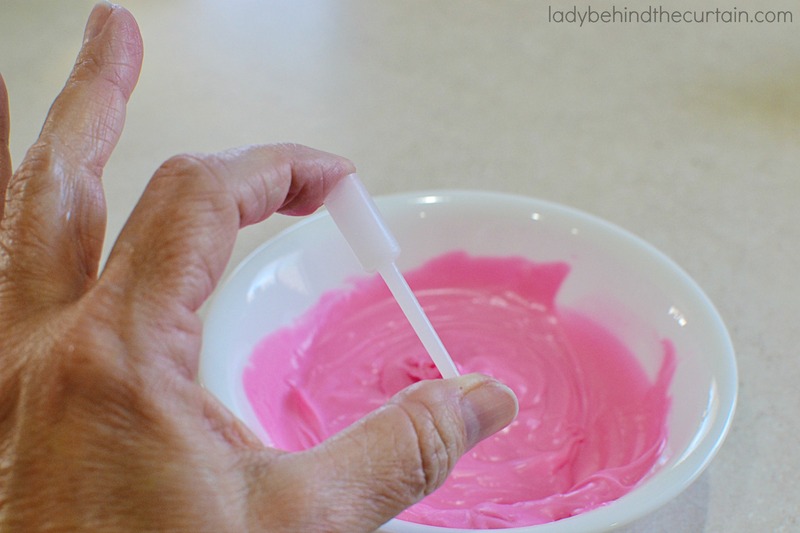 TO MAKE THE COLORS POP…USE THE SAME COLOR OF CANDY MELTS AND SPRINKLES. 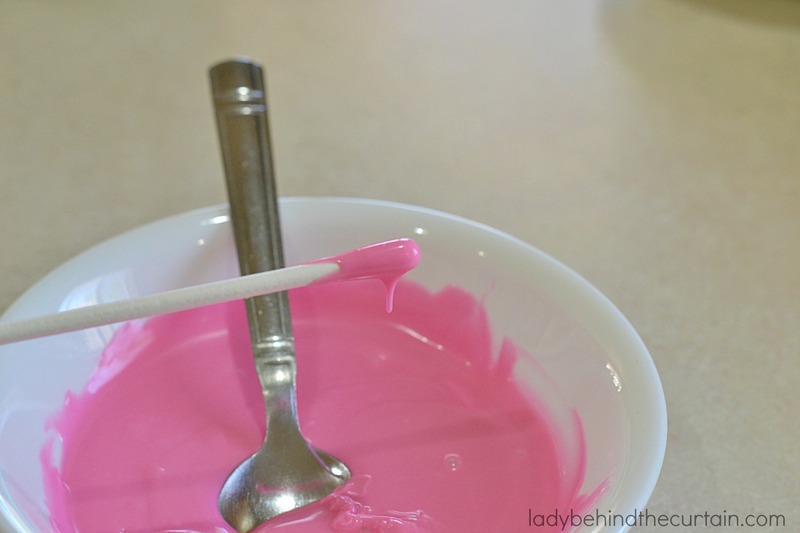 Pour sprinkles into small bowls with spoons and whatever you will be putting your finished marshmallow pops in. Like a piece of styrofoam or a container of rice. Choose the best marshmallows from the bag. STEP 2: Dip one end of the lollipop stick into the melted candy, lay the marshmallow on a flat surface and press the lollipop stick into the center of the marshmallow. Making sure you go straight in. Transfer to a cookie sheet lined with wax paper or I prefer using a mini muffin pan (it gives the marshmallows more stability) Place in the refrigerator for 5 minutes or until candy is hard. STEP 3: When candy is hard, take out of the refrigerator and dip the whole marshmallow into the melted candy. Use a spoon to help cover the top (the portion with the lollipop stick) NOTE: If candy has cooled too much put it into the microwave for 30 seconds to melt it again. NOTICE… I AM COMPLETELY COVERING THE MARSHMALLOW. THAT’S TO PRESERVE THE FRESHNESS OF THE MARSHMALLOW. STEP 4: Tap the edge of the bowl/measuring cup to get any excess melted candy off. 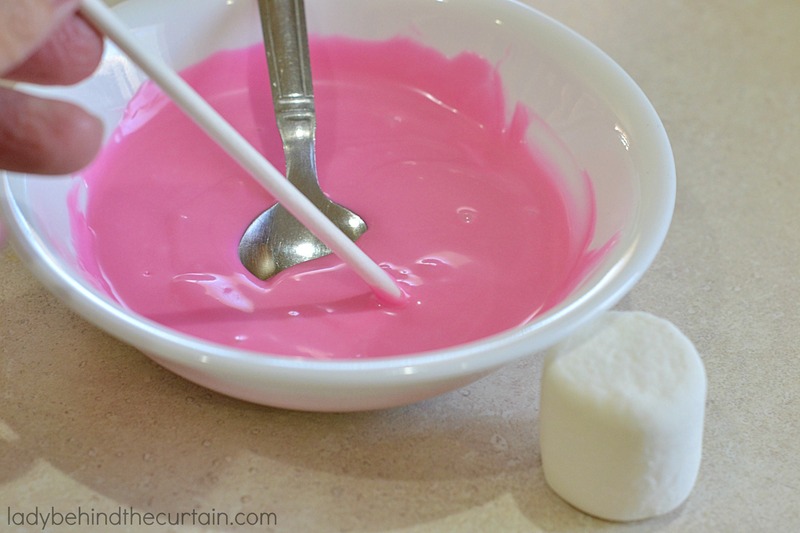 STEP 5: As soon as the marshmallow has been dipped in the melted candy use a spoon to sprinkle on the colored sugar making sure to cover the marshmallow completely. 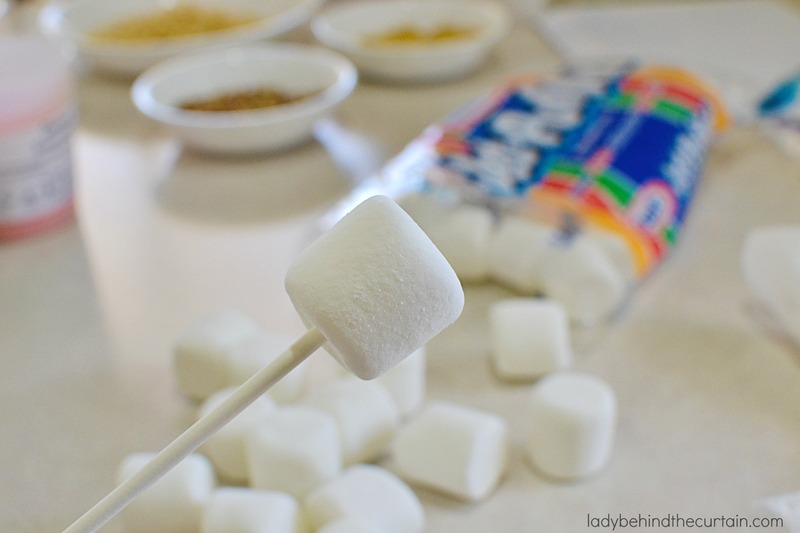 STEP 6: Place finished marshmallow in an upright position (like a piece of styrofoam or a container filled with rice). 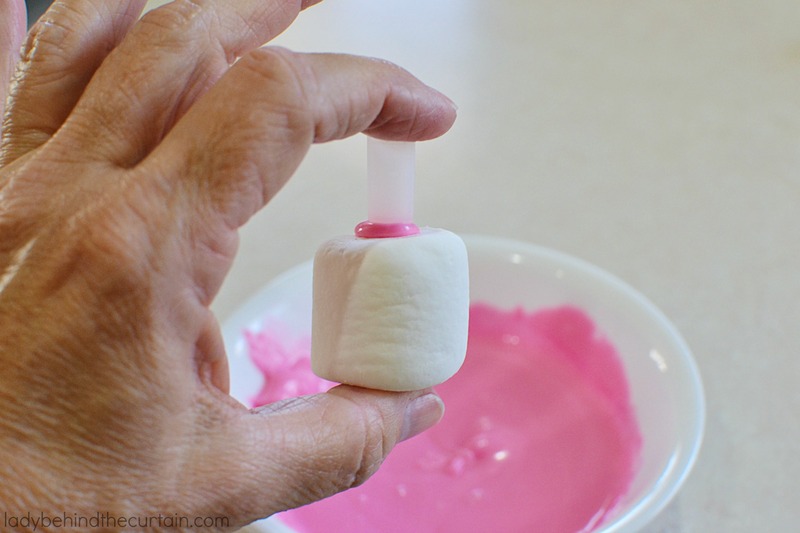 Put the container with marshmallow pops in the refrigerator 5 minutes or until hardened. NOTE: These can be stored on the counter at least a week. The candy coating protects the marshmallow from drying out. 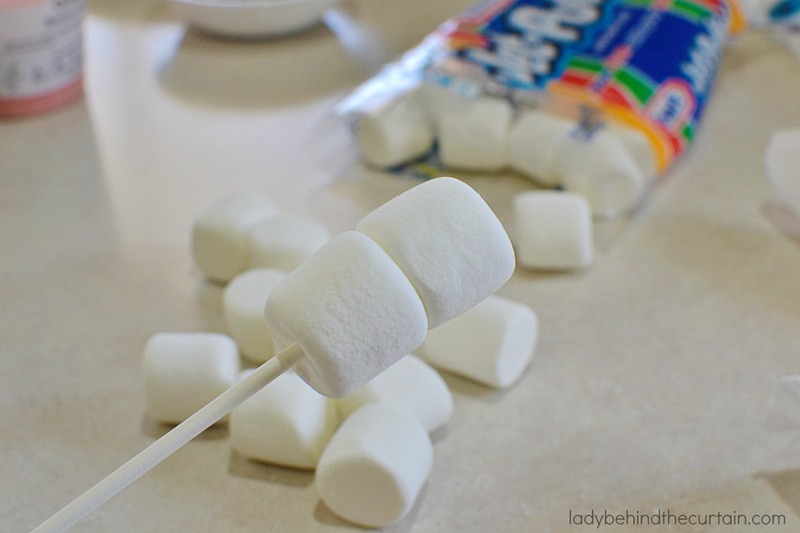 Press THREE marshmallows onto a lollipop stick and follow STEPS 1 through 4 and 6. Once the candy shell is hard melt either coordinating colors or follow what I did. 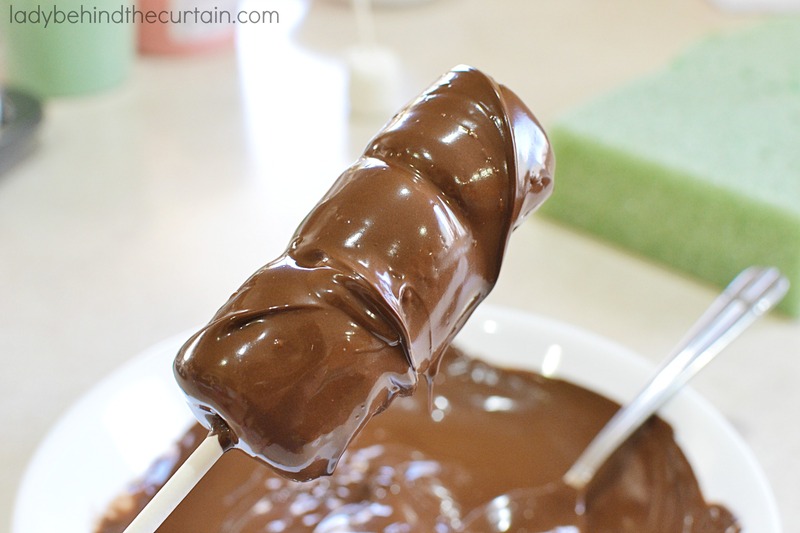 First I dipped the marshmallow pops in melted dark chocolate (let it harden) and drizzled on milk chocolate and white chocolate for a triple chocolate explosion! 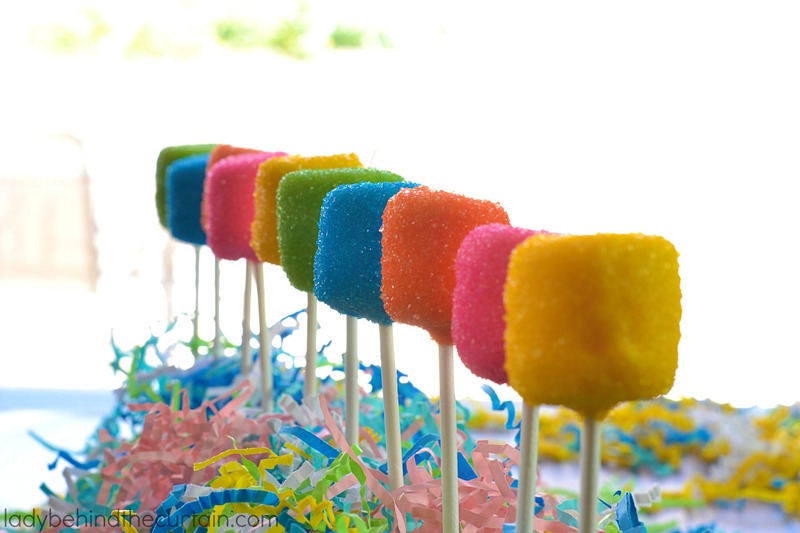 Fun treats for a classroom birthday party! 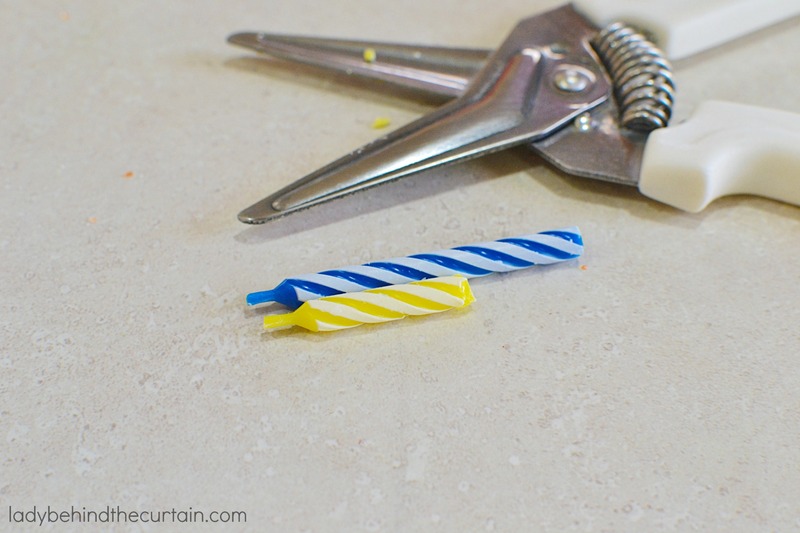 Cut birthday candles to the desired height and set aside. Begin by following STEPS 1 through 4 and STEP 6. 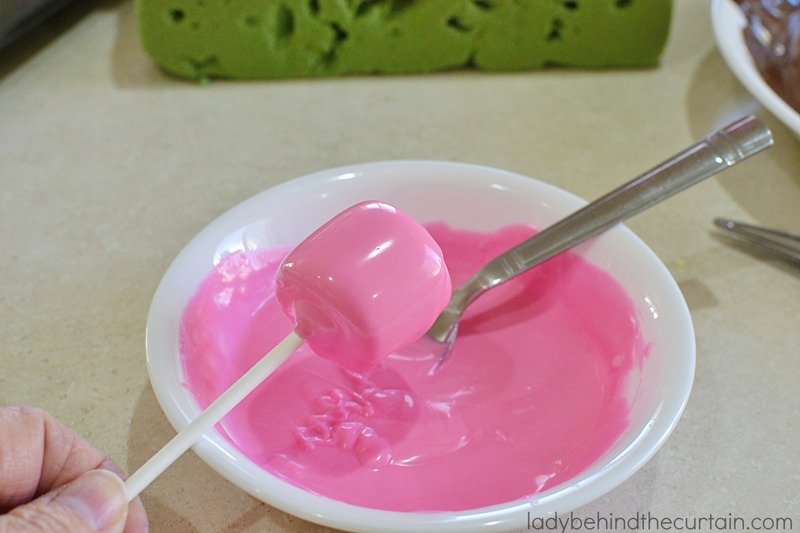 Melt more candy (this can be chocolate or a color to compliment the color already on the marshmallow) Add a dollop on top and using the back of a spoon push it slightly over the edge to help it to look like frosting dripping. 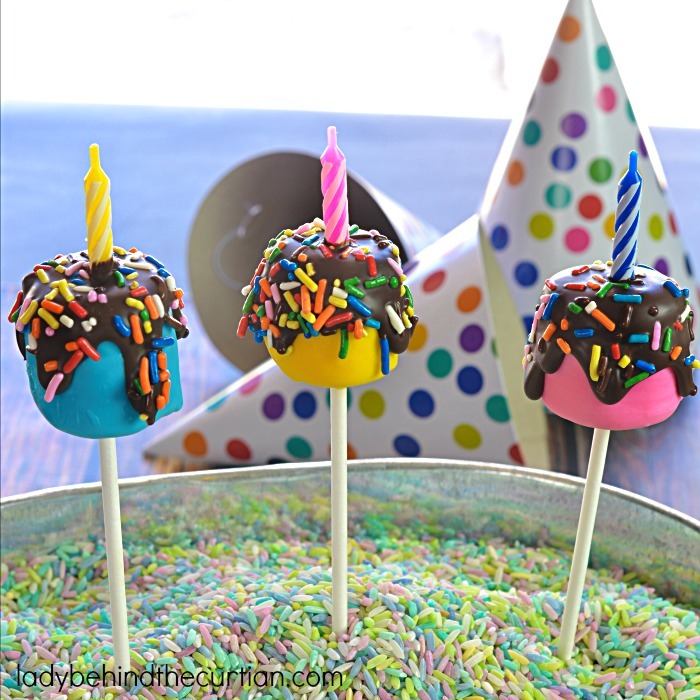 Add fun sprinkles and a birthday candle. Hold the candle in place a few seconds until the candy has had a chance to harden some. 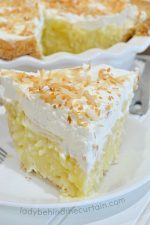 This is a fun variation on the popular rice krispies treat. Begin by following STEPS 1 through 4. 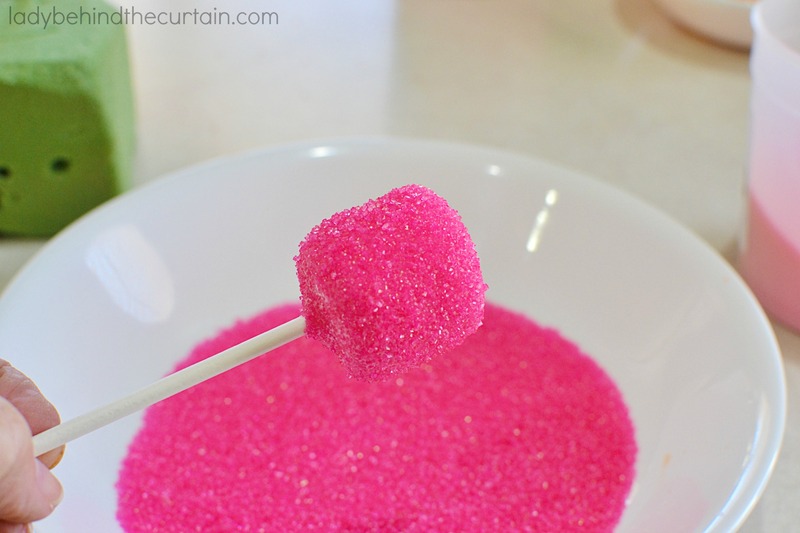 While the candy is still wet sprinkle or dip into a bowl of rice krispy cereal. 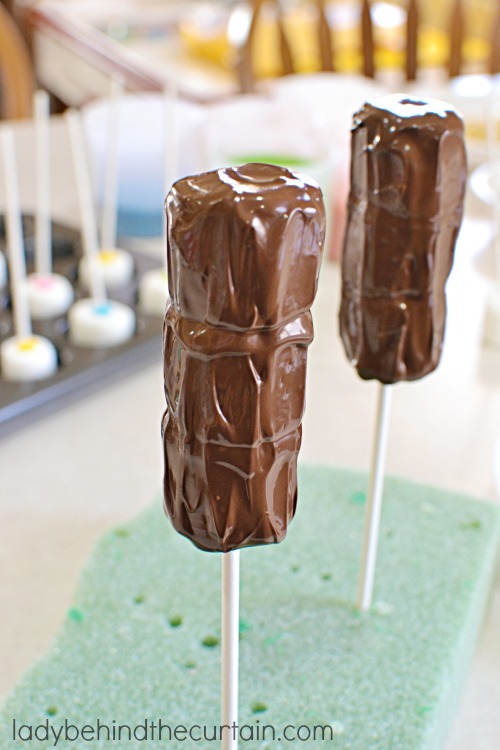 For fun make some that are dipped in white candy and some that are chocolate! 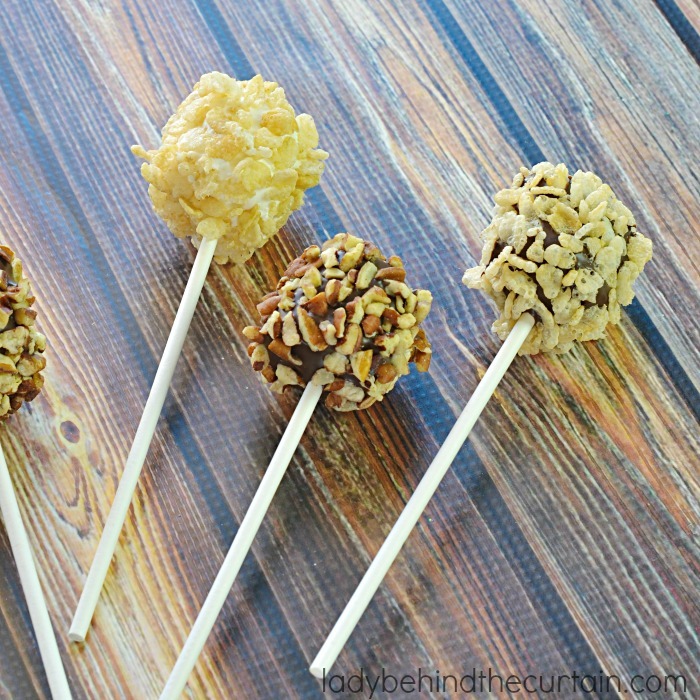 Create your favorite candy bar into a fun party treat! Begin by following STEPS 1 through 4 using dark chocolate candy melts. While the candy is still wet sprinkle or dip into a bowl of chopped walnuts. These look great! How far ahead do you think they can be made? 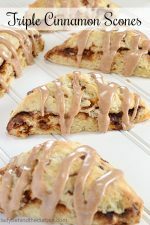 If I make them the day before I need them, is it best to leave them in the fridge over night, or out on the counter? Leave them out on the counter. The chocolate will seal in the freshness of the marshmallow. Thanks for this tutorial, I made them for my niece and my husband’s birthday party everyone loved them. 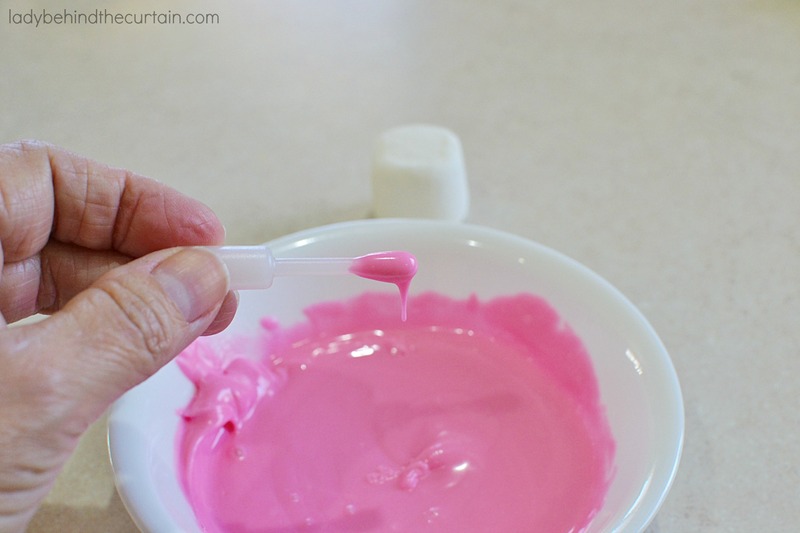 Hi Teri, If you are decorating the marshmallows to be completely dipped in melted candy. They are fine to sit out. The coating protects them and keeps them fresh. 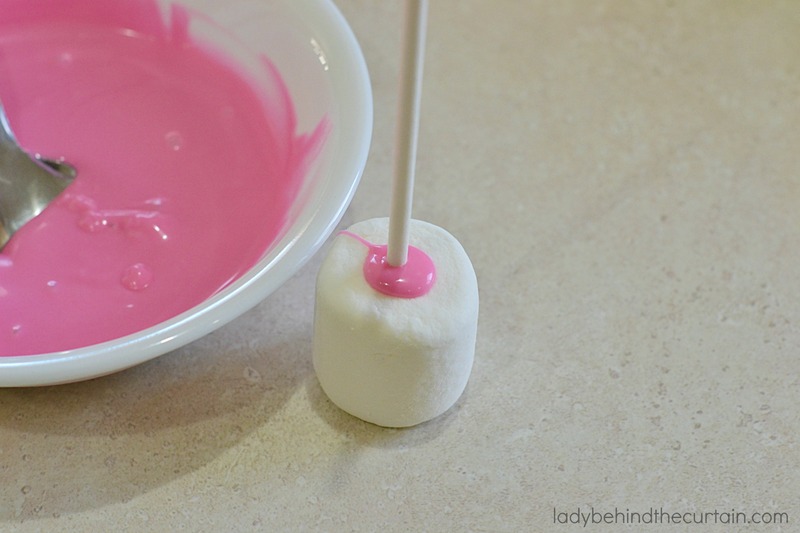 I am trying to make Sugar colored Marshmallow pops( Red/Black/Silver) for March 14th. How many days ahead can I start making them? 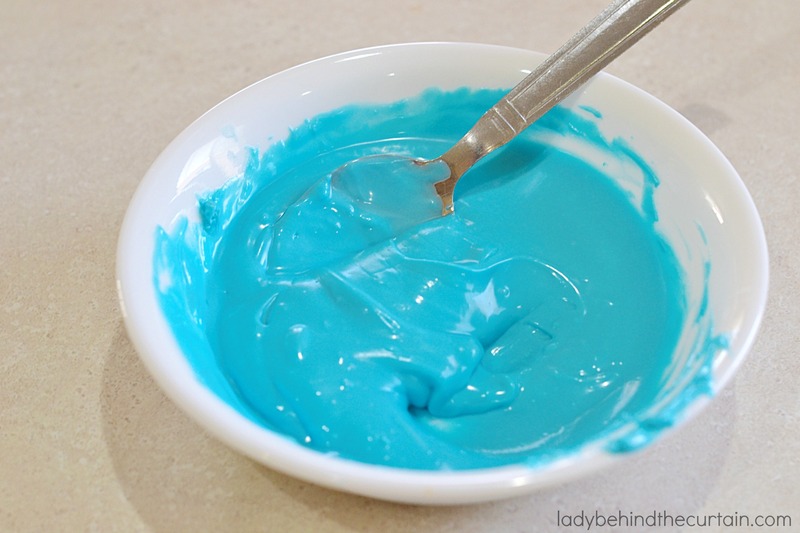 Also if I am just using the colored sugar do I need to add the melted candy or it can be done without? Hi Yolanda, In order to preserve the freshness of the marshmallows..yes, you’ll need to dip the marshmallows in melted candy. Plus, the sugar will need something to stick to. I have had them out for a week and they were still fresh as the day I took them out of the bag. That’s the awesomeness of the the candy coating! HI! thanks for sharing your tips, I want to do them but just cover half of it with candy melts, how do I store them for two days? Hi Gisele, I would do a trial run. 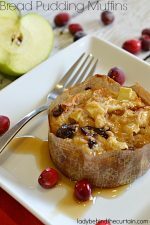 Dip them the way you want, put them in an airtight container for a couple of days and see what happens. If you left them out they would dry out for sure. They all look great,,, I was wondering how long can I store half dipped marshmallows for?? Hi Sharon, If you’re only dipping half of the marshmallow I would recommend wrapping them with lollipop wrappers. Then I think you’ll be safe for a couple of days. Hello Sheryl. This is such great and easy idea. Im making them for a baby shower and Im organizing. I will make like 100 and will individually wrap them. You wrote they could be done a week in advance. With the hot weather I am going to put them inside the refrigerator so they dnt run on me. I was wondering if the colors stay the same and do you think I will have condensation problems when I take them out? Thanks. Hi Audrey, I really don’t know. The only advice I can give you is to make a trial run. Just do a few and see what happens. Refrigerate some and leave some out. What type of candy should I melt? Hi Mariane, Since the marshmallows are coated with melted candy they will last several days. u r so sweet to answer everyones questions. so i have 5 small kids 8 and under and i do not cook! but i am starting to do cute stuff for them or at least trying:). anyway we are snack family next week for basketball and thought to make basketball marshmallow pops. (i bought 1 for my son for valentines day somewhere and he loved it). my questions is after i make them all orange the one we bought had black lines in it like a basketball. do u know what i could use to make such skinning black trim on the marshmallow? 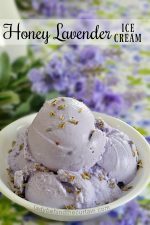 I want to make this using white chocolate and dying it purple.. I cant seem to get the chocolate to go hard after. It feels soft to touch after it has been in the fridge and a bit wet.. am I doing something wrong? 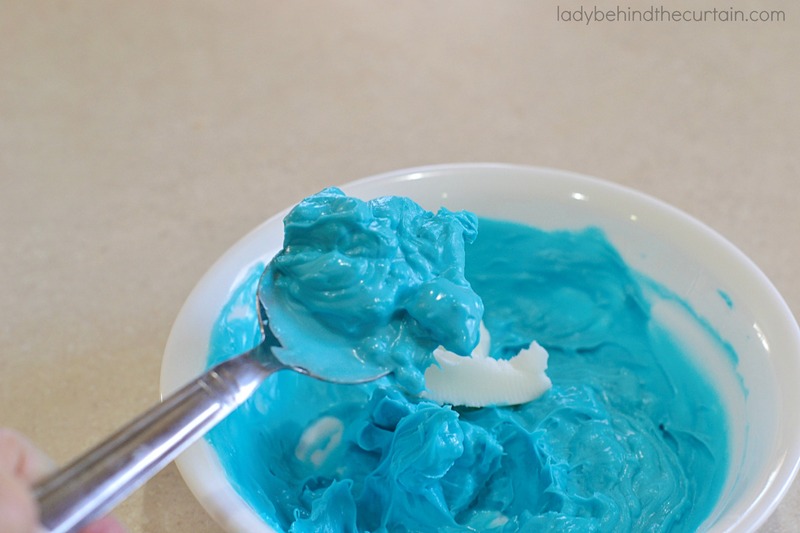 Hi Abby, Are you using Wilton Candy Melts or chocolate chips? Hi Cassandra, Only one day in advance would work for half dipped marshmallows. If possible I would dip the whole marshmallow. 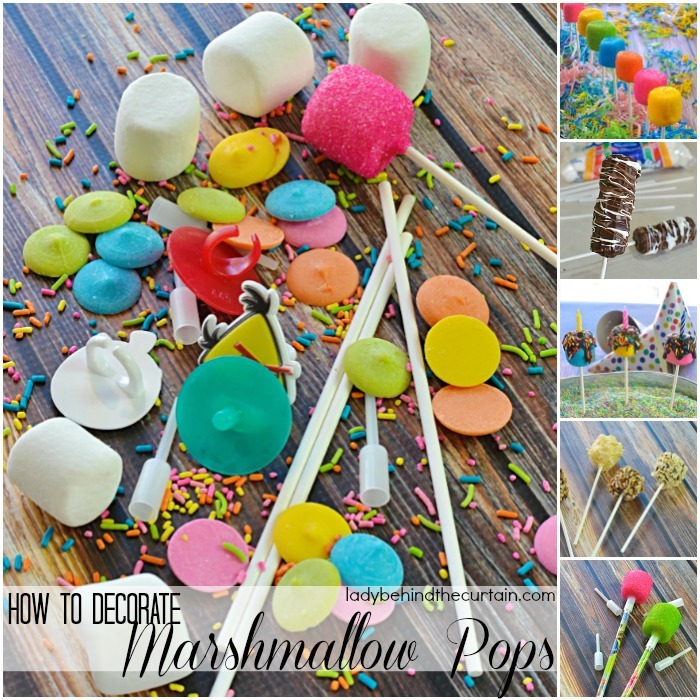 To give the marshmallow a more decorative look you can only add the sprinkles half way up. You need that protective coating to keep the marshmallow moist. If you dip the whole thing then it will stay good up to a week. Store at room temperature, place on a tray lightly covered with plastic wrap. 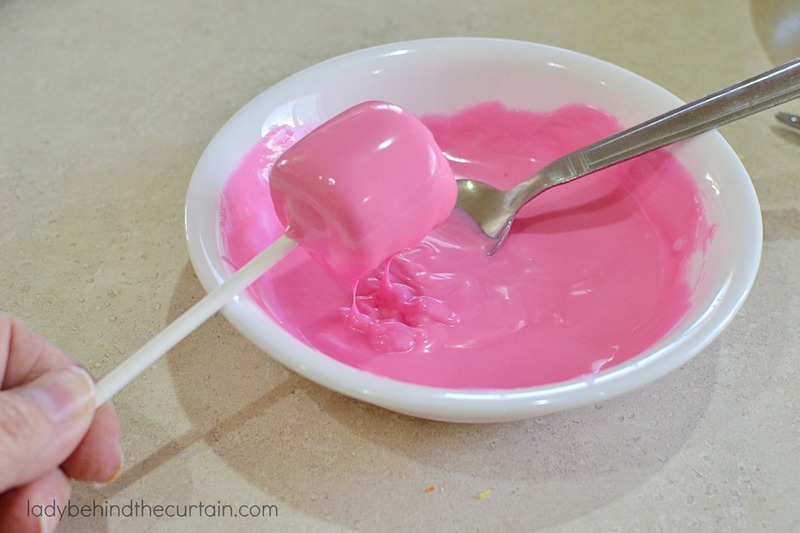 Hi Patricia, I would use a small amount of the melted candy as glue for the eyes….and I would store the marshmallow pops out on the counter. I having a hard time locating the pencil inserts. 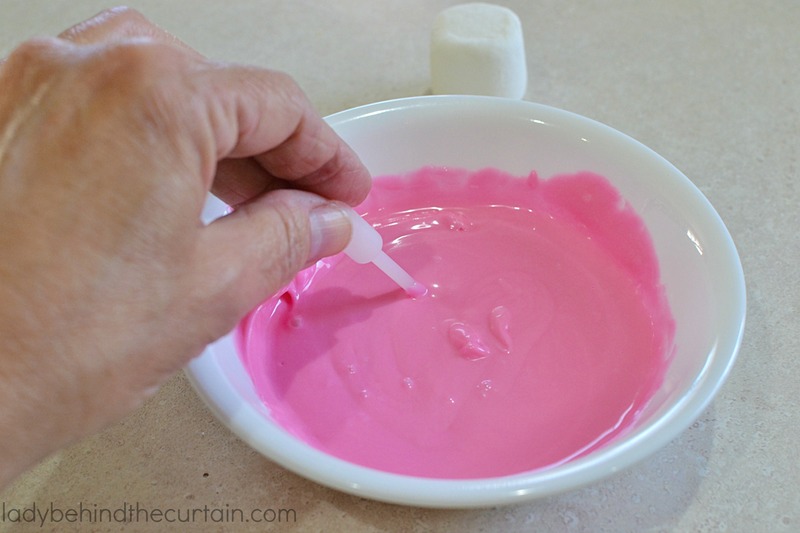 Hi Nica, Once you have your marshmallows covered in the sanding sugar and they are dry, Add a little dollop of the melted candy you use to make your molds. While the candy is still wet (soft) attach the hardened candy molds, hold a few seconds until the melted candy hardens enough to hold the candy mold. Where does one get the little plastic pieces that you used to place a pencil instead of a pop stick? How would you recommend doing stacked pops with 3 different colors? 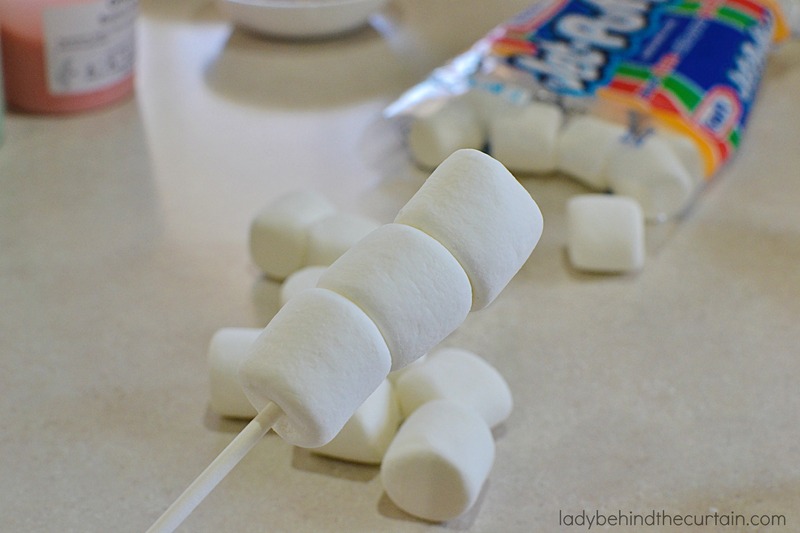 Hi Carlie, You could try drizzling the different colors over the marshmallows OR place the first one the lowest on the stick, dip, let it harden, place the second one on top but leave some room between, dip and with a fork push the marshmallow to the first marshmallow. 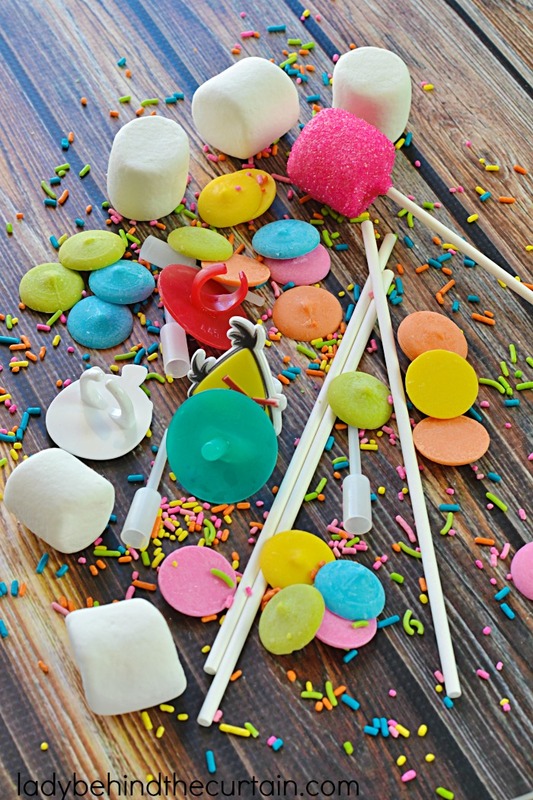 You could choose to fix what the fork messed up by drizzling on some of the melted candy or leave it since the last marshmallow will be covering it. Let it harden. Add the top marshmallow again, leaving some room between it and the center marshmallow. Finish my dipping it in the third color. Place in a jar full of rice to finish hardening. NOTE: If you want to add sprinkles you’ll need to do that while the candy is still soft. Hi, I’ve never done anything like this before. How much candy melts should I buy for 30 or so marshmallows? Hi Zenobia, I think about 2 (12 ounce) bags. If you are making marshmellow snowmen and only dipping the top, which is the hat, could you seal each one individually and keep them fresh for a few days? I am making them for a group of people (41) and know it will take a little time to make them. Yes Martha that would work. Approximately how many pops do you make with one bag of wiltens candy melt?